Mick and I spent many a moment tossing a coin – Sandringham or Anglesey…. Anglesey or Sandringham…. Mum’s Birthday, or Sandringham? In the end, Anglesey and Mum’s birthday won the toss. I’m sure Her Majesty will forgive us…one day!! We planned to get an early start but needed the farrier and he was on farrier time on the 22nd June! We’d said, “Come early”, but we had different views of what that meant, and shoeing 4 horses seemed to take forever! Eventually, we waved the farrier goodbye and got ourselves loaded and off, but much later than intended. The consequence was traffic – lots of it! The horses were very good and put up with the 5 hours of travelling without a murmur. As we got closer, the scenery became more and more beautiful and tunnels under mountains became more frequent. We took a wrong turn on coming onto the island, but were really pleased, as that afforded us a fabulous view of the old Menai Bridge, which was breath-taking and said “Welcome to Anglesey” better than any sign. We finally arrived at the field and Tina and Dave had kept us a nice pitch, so we could park up together. As we messed about setting ourselves up, everyone else ate their dinner, so we joined everyone for a drink and a chat. Sal Ingam and Mystle paid us all a visit and it was lovely to catch up. Saturday dawned fair and we found we were sharing our part of Anglesey with a Land Rover convention. There were Land rovers everywhere, to the delight of some, but I should imagine to the dismay of Mary, Claire and the rest of the organising team! 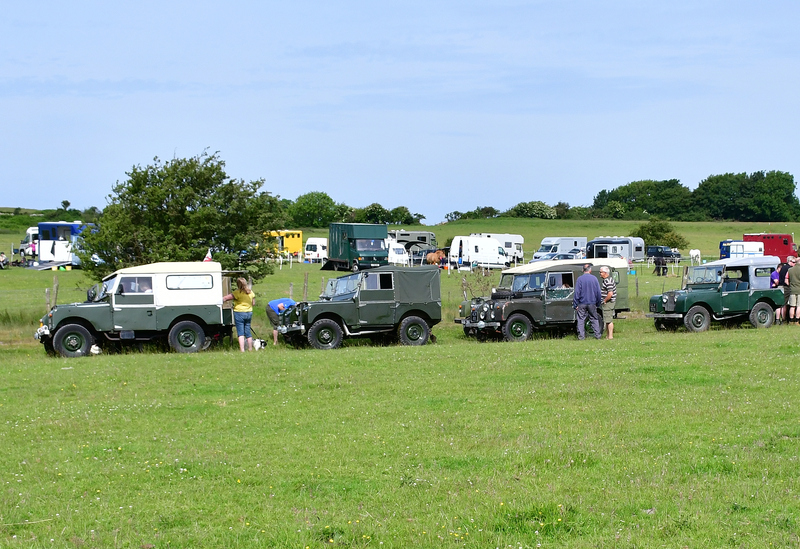 We had a fabulous ride, which had several episodes of meetings with numerous Land Rovers and involved meeting several Dave Cromartys – can anyone tell me how many of them are out there? One minute there was Dave the Checkpoint judge, then Dave the cameraman, then another check point judge…and so it went on! There was one of those points on the ride where one of you thinks you know where you are going and the other is totally non-plussed. Mick and I nearly ended up needing a divorce lawyer and then, in the nick of time a mediator appeared, in the form of Ailsa Gibson. Isn’t it amazing how you can shove your gremlins quietly into the saddle bag when somebody else appears? The ride was beautiful and had a few challenges – you know the sort where the map and the ground suddenly seem to bear no relationship with one another – but we got back safe and sound, in time to walk the PTV, before a lovely supper of fish and chips for some and veggie burger and chips for others. 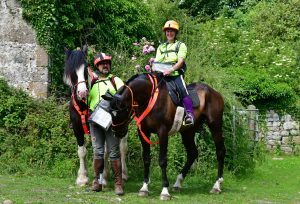 I’d been messing with the cat and horses and got to supper a bit later than most, to find that there had been an issue with chip availability and there had been a chip whip round on my behalf – only at TREC…! I swear I had more chips than anyone! 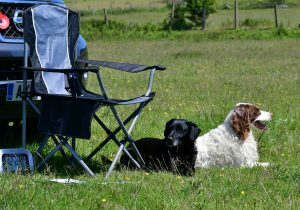 Then, would you believe it, we had two latecomers for their meal and the lost chips were found in the dinner box! By then everyone was too full to eat them! Margaret Fern had kindly made everyone lots of crumble and for those who didn’t want it on the night, we got to take it home, to savour later. 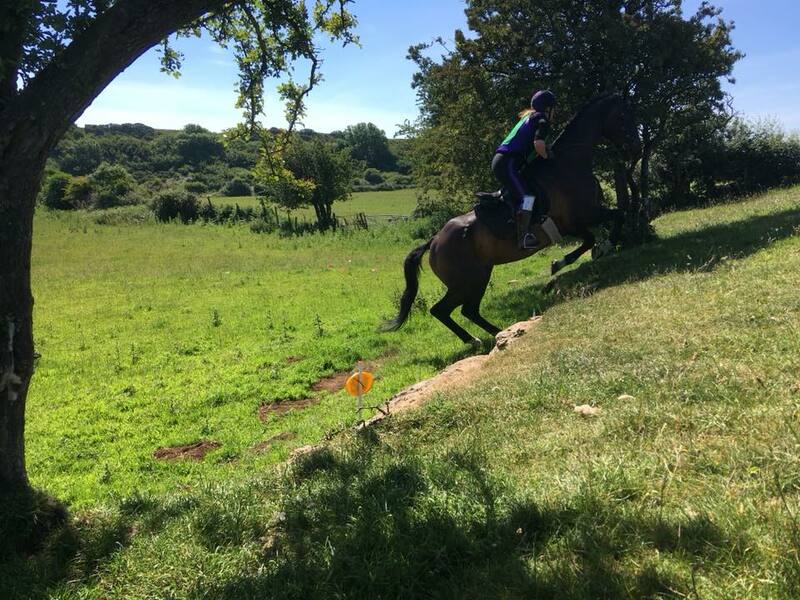 The PTV on the Sunday was great fun, but the first 3 obstacles caught many out – yes, including Mick and me! I set off on Malcolm – should I canter this or not? I went for a canter through the corridor and ride down, but blasted straight through the neck rein, laughing at myself half for thinking my brakes were good enough and half for being stupid enough to try it! Malcolm stood beautifully for the remount and I was proud of him. 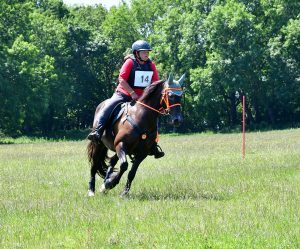 As I went to ride away, I thought there was something weird about my steering and then realised I had managed to cross my reins, when I had put them over his head – doh!!! Bless him – he stood like a rock and let me throw my reins over and straighten then up, ready to ride on to the next obstacle. My favourite obstacle was the step up – a rocky outcrop, which I had told everyone I wasn’t doing, but Malcolm was going so well when I got there that I pointed him at it and he did it beautifully – well done Malc! Mick says Prince went up the step up like a steam train! The PTV was really well thought out by course designer extraordinaire Sarah Wynn and a great ride with a number of challenges, including what looked like a nice simple s-bend, but it was in a dark corner and caught a lot of people out – I judged it in the afternoon and found it interesting to see how some horses didn’t like the shadows. I had a great view of the Shamrock and between judging, found it interesting to see the different styles of riding that obstacle. At the end of the day, the sun was shining and we all waited for the scores. 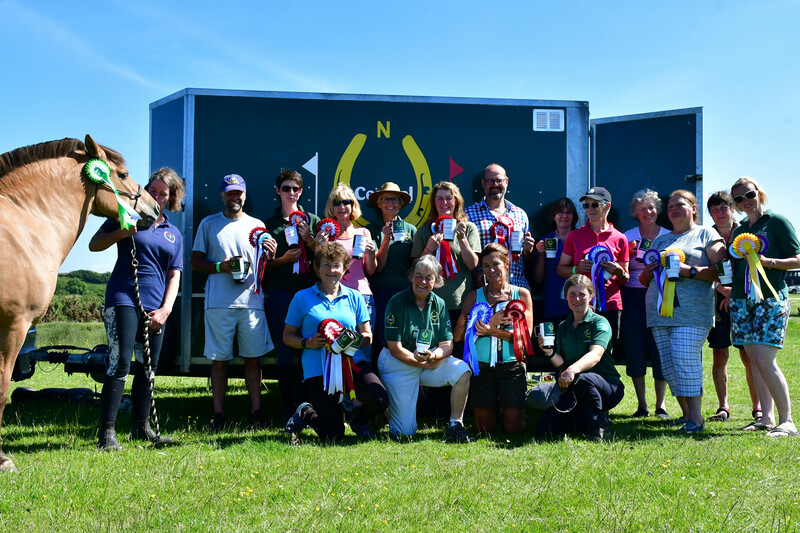 Mick and I won our class and our team with Tina and Dave were first in the teams too. We had our photographs taken together and it was a perfect end to a perfect weekend. 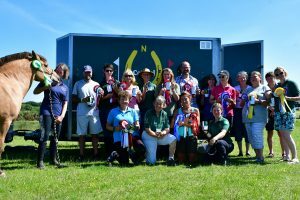 Roll on the next Anglesey competition and well done to all of the people involved for making it a truly special event – made even more challenging to organise as it was so far from home turf. THANK YOU!